Online Training is an affordable way to keep on top of your fitness goals, on your own schedule. It is a great option for those who are looking to have a solid training plan, continuous support and accountability, and track their nutrition, on the go. If you are 🌟 new to the gym or 💪🏻 working out, if you are able to learn from 🎥 videos, online coaching might be the right option for you. All my programs are designed by ME, specifically for YOU. Daily Tracking and Monitoring – 🔐 Key to success! If you live in the area or in a different country, online training is a great way to stay on track of your goals, and I will be there for you every step of the way. Weight training is an essential element in increasing strength, stamina, and endurance, change your body shape and increase your metabolism. What ever your goals – lose body fat, gain muscle, or just become a stronger version of you, I can help guide, and teach you how to train effectively, efficiently, and safely. Together, we will develop your toolbox of knowledge, so you feel confident, and not intimidated by the gym atmosphere. Our training sessions will be productive, and you will learn not only various exercises, but how to train. Other aspects we will go over in the gym include: types of exercises, reps and sets, instruction on technique and possible variations and mobility, cardiovascular work, and stretching. You may contact me here, to set up an appointment or through facebook. Note: I train clients from around the Sherbrooke, Qc area, who hold memberships at other gyms. 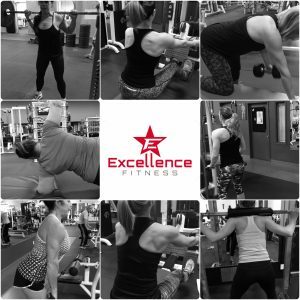 It is possible for us to work together, even if you do not have a membership at Excellence Fitness. My rates are separate from Excellence Fitness membership. Individualized Meal Plans – 3 month minimum sign up. Diet is defined by Merriam-Webster.com dictionary as “habitual nourishment”. Frequently, we ‘nourish’ ourselves too much, and pay little attention to our internal cues to eat – emotional hunger can overwhelm us and lead us down a path in which we no longer recognize ourselves in the mirror. When it comes to losing body fat, or get insanely lean, gain muscle, or prepare for a marathon, proper nutrition is essential to achieve your goals. 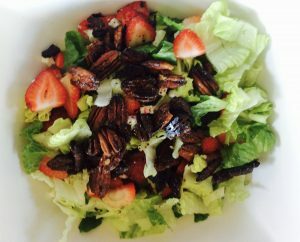 Based on your food preferences, I will create a personalized nutrition plan. I will tell you when to eat, which foods are best to achieve your goals, and amounts. Your diet will be designed based on your current eating habits, lifestyle, fitness goals, time restrictions and commitment level. I will do all the thinking for you, so all you have to do is implement the plan. Your posing/presentation on stage is essential in displaying your hard earned physique. It can determine if you are SEEN by the judges or completely IGNORED. Presentations styles offered included fitness, figure, fitness model and bikini categories for the new Canadian Physique Alliance (CPA), Canadian Bodybuilding Federation (CBBF), Association des Physiques Quebecois (APQ), International Federation of Bodybuilding (IFBB), Serious About Fitness (SAF), and Physique Canada (PC), International Drug Free Athletics (IDFA). I will instruct you on the introductory presentation, quarter turns, and callouts. We will work with your body to determine how to hold your body best, to show off your assets, and hide your flaws. I am available for private one on one, and group posing sessions. Feel free to contact me here, or through my social media. With over 70+ shows to my resume, I have gained and lost over 900lbs over a 17-year period. With two kids over the last 10 years, being in the industry since I was the young age of 20, I can appreciate how the body changes, with age, and after children. I have made a career out of losing bodyfat, and learning how to keep it off. Whether it be for a photoshoot, or stepping on stage, let me guide you to the more balanced way to get lean, and teach you how to manage the post show period. As this type of training is much more involved, I coach only a handful of clients for this type of physique goal.